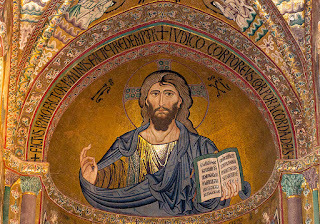 A few months ago Pierpaolo was preparing a seminar on Christology, at table he asked us all to close our eyes and to describe the the image icon or painting that came into our mind when we thought of Jesus. 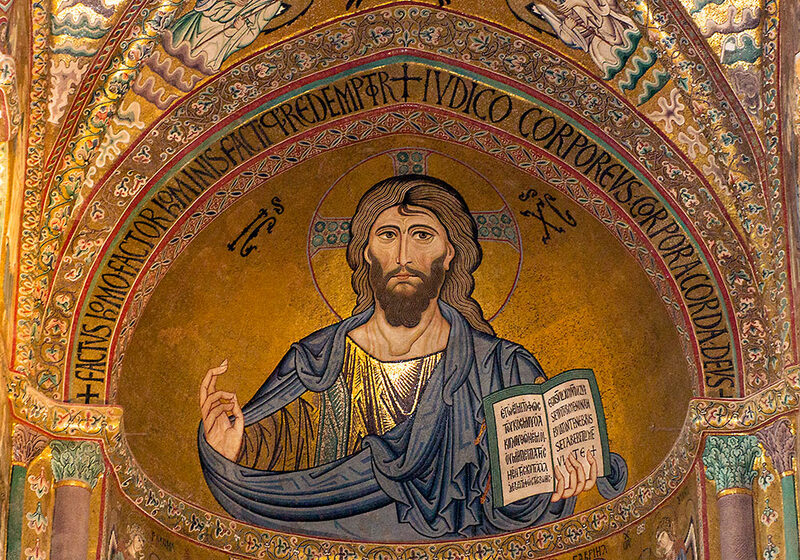 Ettore mentioned an icon of the 'Good Shepherd' which I had painted for the boys' bedroom some years ago, Pierpaolo came up with the 'Christ Pantocrator' from the Cathedral in Cefalu' (Sicily) and so on... When closing my eyes to my surprise the image of Jesus that came into my mind was the one of the 'Divine Mercy'. I am (to my shame) not the devotional Catholic type and I never particularly liked that specific image of Jesus, I always thought he was too feminine and sweet a Jesus for my tastes, with whom I felt no connection and then there was that very dark background. Yet that was the image that came to my mind so clearly! For a whole year that image had been before my eyes in the chapel I visit and when the blessed sacrament was not exposed that picture never failed to be present and bring peace to my soul. When I said THAT was the image of Jesus I saw, everyone had a giggle... but something within me was awakened. I was as surprised as anyone but I felt I wanted to know more about it, after all, my beloved John Paul II strove to live and teach the message of Divine Mercy, so one more reason for me to see what all the fuss was about. 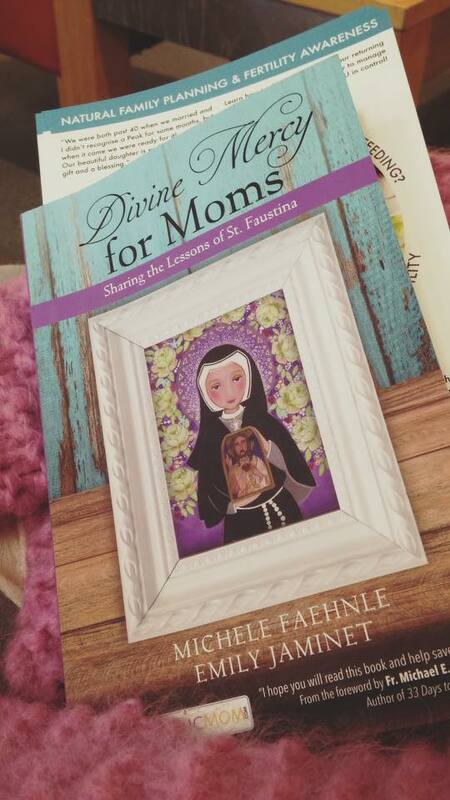 Some weeks after, on one of the Facebook pages I follow, there was a post about a recently published book, for people to read and possibly review, by the title 'Divine Mercy for Moms'... I was intrigued and took on the quest. The book took longer than expected to arrive and I was eager to read it with no interruptions... but being a mother I soon rediscovered that there is no such thing as no interruptions. As I started the first two paragraphs, John Paul II was mentioned twice and my heart rejoiced... the more I read the more I wanted to read it! The book was an easy and gentle introduction to Sr Faustina and the 'Divine Mercy'. It was practical and very simple to read but never patronizing. 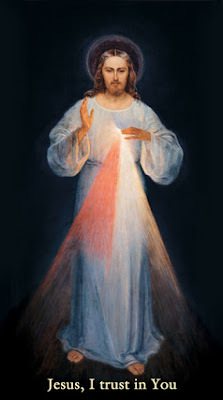 Michele and Emily, the authors of the book, humbly write about their experiences of the Divine Mercy and share with the reader slices of their life. 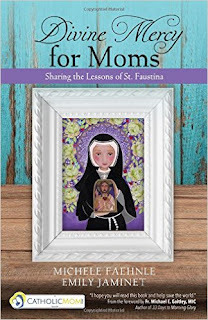 The book is rich with lovely events in which clearly both mothers have encountered and embraced the Mercy of the One that is Love and as you go through and read more, you never feel that what they are writing is irrelevant nor merely about themselves. Mercy is at center of it all. They have discovered something that helps them in their vocation as mothers and not only have the desire to share it with the rest of the women who like them have had the same calling but feel the urgency of spreading the message. There has never been a more appropriate time than this to read this book... 'The Year of Mercy'... a year in which we, Catholics have been encouraged to contemplate the need for Mercy and have been reminded that as children of God we are constantly (not only during this special year) called to performed 'Corporal and Spiritual works of Mercy'. In the book some practical suggestions are listed without ever overwhelming the reader since it says in the book: 'Motherhood and spiritual works of mercy go hand in hand'. As a mother, carrying out your daily duties, you will find yourself naturally performing many of them and if you hadn't realised yet, reading the book will help you to be aware of them all and will encourage you to look at the One from whom we draw strength. As I was reading, it was clear that the book had landed in my lap not simply to be reviewed but for me to deepen my knowledge of Him, so that I could recognise my lack of mercy towards many people around me and the missed opportunities to practise it. 'JESUS I TRUST IN YOU', ... these words are engraved in my mind! It is only by us accepting and surrendering to His mercy that His mercy can be showered upon the many souls that thirst for it. It amazes me how the Lord doesn't waste any time when we open the door to His word... He soon brought before me many opportunities to serve Him, always providing the strength needed to carry out what was asked of me. Reading the book has been accompanied by daily events where acts of mercy were required and just like in St Faustina's diary people in need of assistance and gratuitous love kept on appearing before me... maybe that had always been the case but this time a veil had been lifted from my eyes and I could certainly recognize the hand of God and the words of Jesus 'Whenever you do this to one of my little brothers, you do it to me.' and not just 'When you feel like doing this...'! 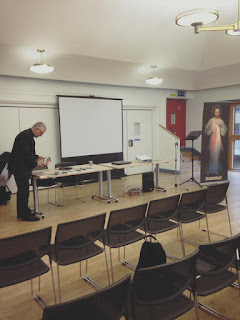 My journey to discover Divine Mercy carried on... in the week to follow, I also attended one of the talks on the saints of Mercy at St George's Cathedral on St Faustina Kowalska, organised especially for this extraordinary Jubilee of Mercy. 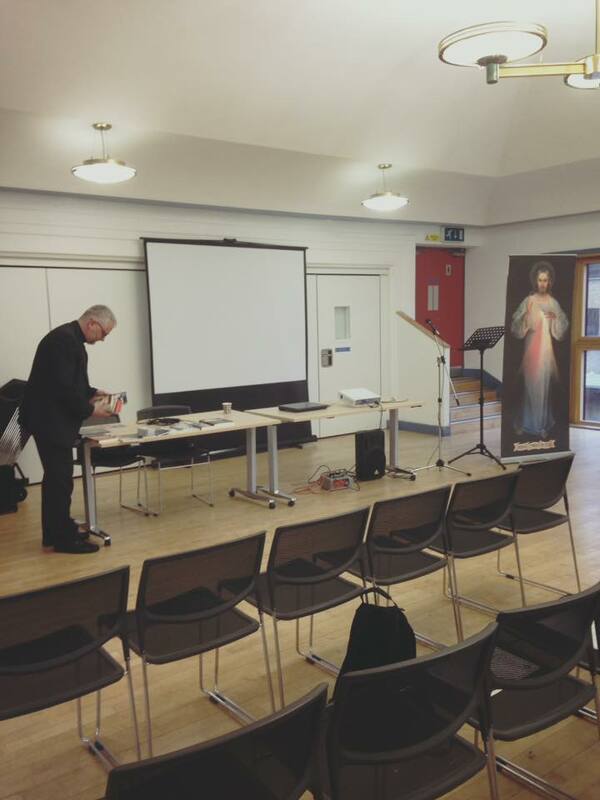 The talk was given by the Polish priest in charge of the Divine Mercy apostolate in London. He spoke with such strength that was music for my ears and that picture that up until now had showed a too meek Jesus for my tastes... was now showing a very masculine and powerful Jesus. The darkness of the picture had been conquered by the light that He himself emitted. The priest drew attention to the half closed eyes of Jesus and as he raised the picture up high... His eyes were looking down just like once they did from the cross... looking down on humanity you could imaging Him saying 'Father forgive them because they don't know what they are doing'. How could I have missed it? There was so much more to it! The picture not only was showing the ultimate act of Mercy but was showing the victory over death, over sin! Oh! Death where is your sting? The light of the Resurrection was now stronger in the image than the darkness I could only concentrate on before then. The rays of light coming from his heart brought gratitude and my soul once again rejoiced. In the white rays I was reminded that in the waters of baptism my family and I have been already claimed for Christ, in these waters our old nature has been drowned and original sin has been destroyed. The red rays spoke of His unconditional love for me and mankind. Only by his precious blood my sins, and the sins of any man who accepts it, can be washed away over and over again, our soul purified and made whiter than snow. It all made so much sense. If you, like us, have been slightly touched by His Love you will feel this calling is for you too! If you have found His Mercy you will, inevitably, want to share it with the entire world! We are no saints here, we are mothers, fathers, children with daily battles and normal problems but when our life is lived for the other with the help and the grace of the One who has given us a new nature, life is lived to full. St Faustina Kowalska was an ordinary girl, as ordinary as you can imagine, poor and uneducated and yet God used her to bring the ULTIMATE message, the key to our salvation. I feel like God has been preparing me for this for a long time and that it was not by chance that Michele and Emily's book drew my attention. The Polish connection in the family, the love for John Paul II ...and many other pieces of the puzzle that have finally started to make sense... all of this to bring me closer to his Mercy, to discover that without mercy there is no salvation and the only thing that I have to do in order to gain it is to 'TRUST IN HIM'. God bless Michele and Emily. May their life always speak of the One that is Mercy. Paschal Triduum. Maundy Thursday and our Family Liturgy. Surprised by a Beautiful Dream!